Hello, Thought Candy readers! Loyal followers of this sorta-yes-pretty-random author blog. I have some announcements to make. And I’m so excited to have a new book cover! All the symbols on this one play important roles in the story, and I’m thrilled by how sparkly and pretty this cover looks! I’m in the process of having the ebook for Bloodshade of the Goddess formatted right now, and that work should be done soon. I’ve decided that when this ebook is finished, I will list this novel for free, in the hope that my fans will let their friends know there’s a super-high-quality urban fantasy they can download for zero monies. 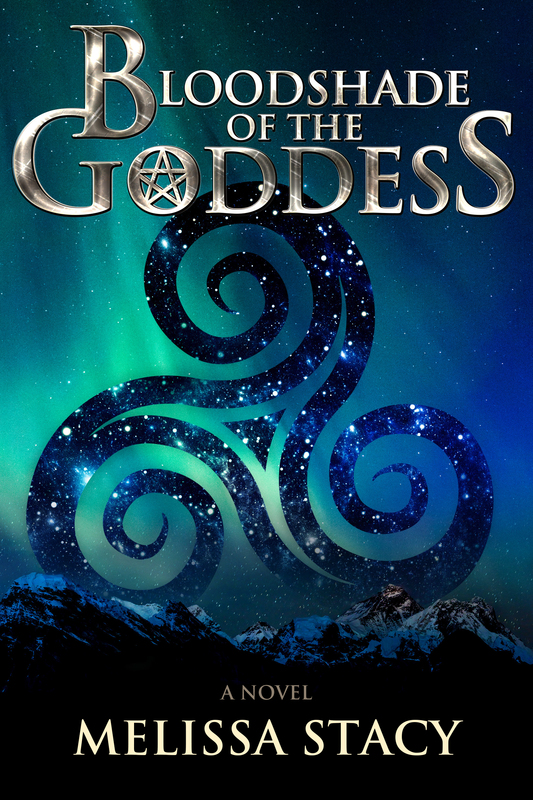 The ebook of Bloodshade of the Goddess will be available on Amazon, Barnes & Noble, and Smashwords. I will share the links with you all, once I have them. In other Big Author News: Mark of the Pterren will be available as a paperback book very soon!! Due to the massive time commitment of formatting a book, and my personal financial constraints, there is always a delay between when I can afford to launch an ebook and when I can have the paperback ready. I’m super, super relieved that my work for the paperback edition of Mark of the Pterren is almost finished, because wow the effort required for anything involving Mark of the Pterren is enormous. For those of you who took a chance on that book, read it, posted a review on Amazon, and shared that book with your friends — I SERIOUSLY. CANNOT THANK YOU. ENOUGH. You are my happy place. You are the people who make me feel proud when other things in my life are not-so-great. Sometimes the world is such a mean and bitter place, and then I think of my little fan base of readers, and I feel happy again. I’m always grateful that I have a group of fans who might not like the different genres I write in, but they’re willing to keep up with my work even if a particular book isn’t for them. Pterren and Bloodshade are two very different books, which are both very different from The Etiquette of Wolves and Love and Student Loans and Other Big Problems. My canon is much like this sorta-yes-pretty-random author blog. Kind of all over the place with the weirdness. Which brings me to my fifth book, Kinned to the Sea, a Young Adult fantasy set in the ocean, starring mer-people. I’m working on the cover for that book right now, and I’m hoping that I’ll have another new cover to share on my blog before the end of the month. This would be **extremely fantastic** so my fingers are definitely crossed. I’ve poured a lot of hours into all three of these big projects this month — 1. the ebook for Bloodshade, 2. the paperback of Pterren, 3. the cover for Kinned. I’m sooooo thankful that I have readers out there who are looking forward to seeing these projects finished. Especially since I had a harsh conversation with an acquaintance in town last week, involving my books. Three years ago, this woman attended a few critique meetings with me, and then left the group, saying she had more pressing things to do with her time, like travel to Costa Rica, Italy, and Australia. She did take all those trips, and many others after that, because sometimes she would email me pictures of her adventures. I enjoyed seeing her pictures, and staying loosely connected with her and her life. Last week, when we ran into each other in person again, the woman asked me if I’d given up on “that ridiculous flying-people book,” and I told her no, not only had I not given up on it, but I’d published it. The woman gave me a horrified look, and asked, “Who in the hell would publish THAT?” and I calmly said that I’d self-published the book. And I thought about how many bestselling books I have read that I didn’t enjoy, and how often we equate money with quality, especially in the art world. As if nothing can ever be beautiful, or valuable, or good, unless lots and lots of other people say so, and someone can prove it by citing sales figures. I admitted to this woman that I had some friends who’d read the book, and that they’d shared the book with their friends, and I felt happy that my book had been shared by my friends. The woman crossed her arms and went into battle-mode. A stance I’ve seen so many times, I just knew I was in for it. Hell hath no fury like a fellow writer who thinks you write crap. I understand where she’s coming from, in that grammar problems stand out to me like red flashing signs in the text, the kind of signs that come with a computerized voice that says, “Warning, warning, warning.” One or two errors in a chapter are easy to blow off, but when the errors mount up, with more than 30 grammar problems per page, my concentration gets ruined. I’m suddenly mired in pronoun confusion, or I can’t tell who is speaking, or whether the brown-haired character who is speaking is the same person as the blonde-haired woman on the previous page. I stumble so hard through the words that my comprehension cannot keep up. This is not always the case, because sometimes I read truly messy stuff and feel swept along by the story. The voice in the prose can do a lot to negate any issues with grammar. It would be nice to be able to hire a copyeditor. Or any kind of editor, for that matter. It would also be nice to travel to Costa Rica, Italy, and Australia. We do what we can. Some of us are more limited than others. That’s not necessarily a bad thing. It just makes us different. I approach my editing needs in a different way than this woman does. From her point of view, her way is better. And maybe that’s true, or maybe we’re just different, and all roads still lead to Rome. It sounds to me as if this woman is just one of those people who can’t be happy without putting others down, and feels threatened by your successes when she’s given up on ever having successes of her own. You’ve persevered when she hasn’t, and she can’t stand that. Judging by her words, it may be that she’s been grasping at what she thinks would be a good idea, and discarded every idea she’s had, giving up before even starting. I love Bloodshade of the Goddess by the way! Melissa….please keep writing, I enjoy your books and blog hugely!!! I always have 2 to 3 books I’m reading at the same time and yours have been among the favored in my virtual library. They aren’t maybe the best I’ve read but saying that, they are entertaining and informative and a real pleasure. Also, your skill improves with each release. “Mark” was the best you’ve done so far…really got into the characters, loved it lots! And I’m not a sci-fi reader, but you got me. You know what your real problem is? It’s that you care about your product, to me that’s not a problem at all!!! Keep going for it and reach for your star no matter where this journey leads, just don’t let the nay-Sayers turn you away.